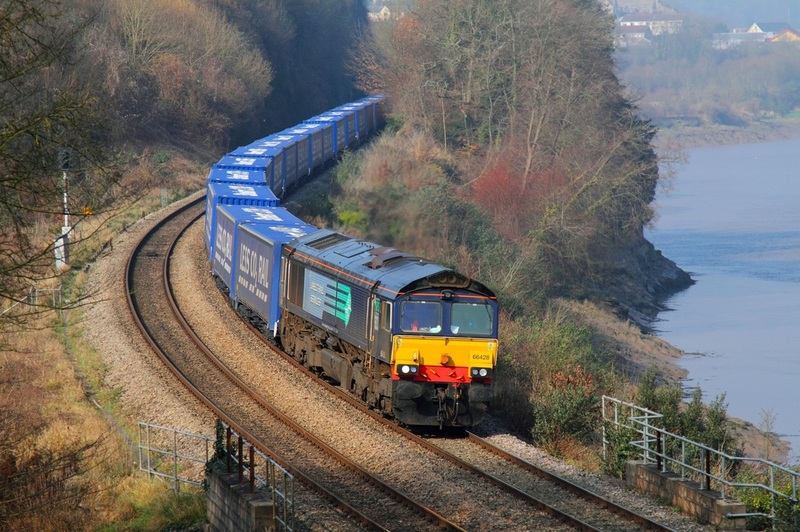 Due to the closure of the Lydney line, the Tesco Express was diverted via the Severn Tunnel to Wentloog and diverted via the marches on return, although the train runs via the marches mondays-fridays anyways, the earlier sunday timings presented a golden opportunity to photograph the train on the marches route in daylight. On the 1st April 2012, DRS' ex-fastline 66304 speeds through Ponthir powering the 4M36 Wentloog to Daventry Tesco Express. Ex-DRS and Ex-Fastline liveried 66434 now sporting the new Malcolm livery (a slightly different version was previously worn by 66412) leads the new 4V38 Daventry to Wentloog Less CO2 Tesco Express at Portskewett on the 5th March 2012. DRS 66428 powers the new 4V38 Daventry to Wentloog Less CO2 Tesco Express at Thornwell on the 1st March 2012.